During Apple’s keynote, Apple introduced the iPhone XR, with an all-screen glass and aluminum design with the “most advanced “LCD in a smartphone featuring a 6.1-inch Liquid Retina display and six finishes. It also brings the A12 Bionic chip with next-generation Neural Engine, the TrueDepth camera system, Face ID and an advanced camera system that creates dramatic portraits using a single camera lens. The all-screen design pushes the display of iPhone XR to its edges. The most durable front glass ever in a smartphone is wrapped in a matched anodized band made from 7000 series aerospace-grade aluminum, and the glass back design enables wireless charging. The iPhone XR comes in six new finishes: white, black, blue, yellow, coral and (PRODUCT)RED. This new design is splash and water resistant, with a rating of IP67, and protects against everyday spills including coffee, tea and soda. The 6.1-inch all-screen Liquid Retina display is the most color accurate in the industry, with wide color support and True Tone for a more natural viewing experience. Precision-milled glass, advanced pixel masking and sub-pixel antialiasing allows the display to follow the curves of the device, while a new backlight design enables the display to stretch into the corners. The iPhone XR supports iPhone gestures like tap to wake, swipe up to the home screen, swipe down to access notifications and the Control Center, and the new haptic touch feature for pressing on the home screen to instantly launch the camera or flashlight. The Apple-designed A12 Bionic features the first 7-nanometer chip ever in a smartphone. It sports a six-core fusion architecture with two performance cores that are up to15% faster, four efficiency cores that are up to 50% more efficient, a four-core GPU that is up to 50% faster, powerful Apple-designed Image Signal Processor (ISP), video encoder and more. All of this unlocks new experiences for games, photography, video editing and graphics-intensive apps while still offering great battery life, according to Schiller. Even with all this power, iPhone XR lasts up to an hour and a half longer than iPhone 8 Plus. The iPhone XR features a 12-megapixel f/1.8 aperture wide-angle lens with an all-new sensor, delivering faster auto-focus, while larger and deeper pixels improve image fidelity and low-light performance on photos and videos. Improvements to the ISP, Neural Engine and improved software algorithms enable portrait photos with a bokeh effect. Smart HDR brings better highlight and shadow detail across photos. New Depth Control allows users to adjust the depth of field both in real-time preview and post-capture to create striking portraits with said bokeh effect.iPhone XR uses LTE Advanced for fast download speeds4 and introduces Dual SIM5 through the use of a nano-SIM and digital eSIM. 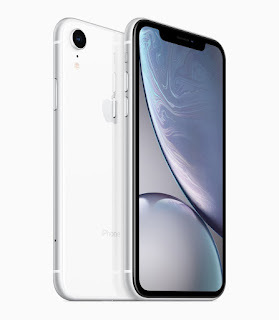 The iPhone XR will be available in 64GB, 128GB and 256GB models in white, black, blue, yellow, coral and (PRODUCT)RED starting at $749 from apple.com and Apple Stores, and is also available through Apple Authorized Resellers and select carriers. Customers will be able to pre-order iPhone XR beginning Friday, Octobe 19, with availability beginning Friday, October 26, in more than 50 countries and territories including Andorra, Australia, Austria, Bahrain, Belgium, Bulgaria, Canada, China, Croatia, Cyprus, Czech Republic, Denmark, Estonia, Finland, France, Germany, Greece, Greenland, Guernsey, Hong Kong, Hungary, Iceland, India, Ireland, Isle of Man, Italy, Japan, Jersey, Kuwait, Latvia, Liechtenstein, Lithuania, Luxembourg, Malta, Mexico, Monaco, Netherlands, New Zealand, Norway, Oman, Poland, Portugal, Puerto Rico, Qatar, Romania, Russia, Saudi Arabia, Singapore, Slovakia, Slovenia, South Africa, Spain, Sweden, Switzerland, Taiwan, the UAE, UK, US and US Virgin Islands.